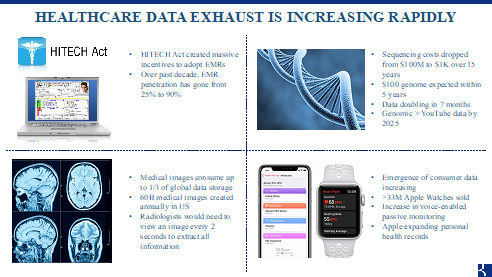 Over the last decade, healthcare has become vastly more data driven — from digitizing electronic health records, genomics data to radiology images, and the emergence of wearables. This dramatic increase in data compounded with the advances in computing, storage, and networking has put in place a massive, irreversible trend. Incumbent providers, payers, pharma, and healthcare IT all want to use this data, but immense challenges make it impossible given the current workflows and regulatory issues. And, this is where we see huge opportunity. For incumbents and the healthcare ecosystem at large, data holds the key to improving service and lowering cost. Emerging deep learning / AI applications can consolidate data across siloes, and make it actionable for more personalized, lower waste care. But, healthcare incumbents are not technologists. Few have deep AI/ML capabilities — resulting in a huge whitespace of opportunity for emerging startups. This is why Adam Fisher, who heads our investing in Israel, and I are launching a Deep Health Seed Program at Bessemer focused on partnering with the best teams building product at the intersection of healthcare and AI/ML. We will invest an initial $10 million in seed-stage startups applying AI/ML to healthcare. Our checks will range from a few hundred thousand to a few million dollars. While we don’t intend to take board seats, we will offer our time, counsel, and help as you grow your company. You can read more about it here. We’re also thrilled to announce that the first company we are backing out of our new program is: Subtle Medical. Co-founded by Enhao Gong and Greg Zaharchuk MD/PhD, Subtle Medical leverages deep learning to enhance the quality and speed of medical imaging exams. We’re incredibly excited to partner with this high caliber technical team and are proud of the progress Enhao and Greg have made. Subtle Medical’s software can decrease MRI and PET exam durations by 4-fold, enabling hospitals and imaging centers to reduce patient exposure to radiation and increase the total number of patients that can be scanned daily. This is a great example of a company using advanced computing technology to improve healthcare workflow (see more below) and provide very compelling, real-time ROI for their customers! In many ways, this program is a continuation of the past. Bessemer has invested in seed-stage companies across all sectors since the beginning of the firm. And Bessemer has always been an early partner for healthcare companies having led the Series A of Allena, Alcresta, Groups, Bright Health, Docent Health and now public OvaScience, Inc. (OVAS), Verastem, Inc. (VSTM), and Flex Pharma (FLKS). For Adam and me, in particular, this program is about focusing on and supporting the founders in this space because we believe AI/ML, when effectively applied to healthcare, will have a dramatic positive impact on our troubled healthcare systems. WORKFLOW: Hospitals are under tremendous pressure to provide high quality services at sustainable margins. Automating back-office tasks can be a huge driver of efficiency, is technically feasible, spans across all areas of healthcare operations, and has a clear ROI for the buyer. Our company, Qventus, is a great example of a team creating huge efficiency in hospital operations. POPULATION HEALTH 2.0: There is a clear opportunity to help better classify patients based on their risk, but products must be actionable unlike their predecessor population health tools. Previous incarnations of “big data” companies presented pretty dashboards that stratified risk, but haven’t engaged users nor led to better outcomes at lower costs. We see an emerging opportunity to use ML/AI to transform clinical insights into action, delivering on the promise of population health. COMPUTATIONAL BIOLOGY / DRUG DEVELOPMENT: Given the rise of genomics information, EMR data, and emerging real-world evidence data, many ML/AI companies are focused on the drug development space. The promise of these companies is intriguing: collect vast amounts of data, apply ML/AI techniques, and new mechanisms of action and drug targets may emerge. However, many large pharma companies are already using computer aided drug design techniques and the unmet need is less clear here. Rather than pure SaaS business models, we continue to believe these companies are more likely to look like drug discovery platforms and traditional full-stack biotech companies. Entrepreneurs in the ML/AI drug discovery space should bolster their drug development teams and prepare for large, biotech-like financings. Separately, we believe there’s an opportunity for ML/AI to apply to improve clinical trial efficiencies as well as enhance commercial teams’ effectiveness. Both of these areas have big budgets here and clear ROI, which will lead to fertile hunting ground for emerging startups. TREATMENT: We think companies that focus on augmenting treatment protocols are going to face the most challenges as there are significant regulatory hurdles, reimbursement challenges, and will have difficult sales cycles if they’re trying to replace doctors and require physician buy in. That said, entrepreneurs who effectively navigate these waters and apply ML/AI to improve outcomes at lower costs will have a huge impact on our healthcare system if successful. We recognize the needs are significant and we hope entrepreneurs will share new opportunities with us that we aren’t even thinking about currently. We are excited about the burgeoning number of talented teams across the globe (from Herzliya to Boston to Silicon Valley) focused on this area. The future of frontier computing in healthcare is awe inspiring. If you are an entrepreneur who sees this opportunity the same way we do, we would love to hear from you! Steve Kraus is recognized as one of the top healthcare investors in the country, with a unique combination of VC, healthcare and policy experience. He serves on the Massachusetts Digital Health Council, as an advisor to Boston Children’s Hospital, BCBS MA, and Rock Health, and co-hosts “A Healthy Dose” — a podcast focused on healthcare innovation, policy and trends. Listen and subscribe to the podcast on iTunes or SoundCloud. Dive into news, insights, and perspectives from the team.